Hi, I am interested in your 1995 Chevrolet Corvette (stock #1705-TPA) listed on Autotrader for $14,995. I'd like to get more information about this vehicle and confirm its availability. 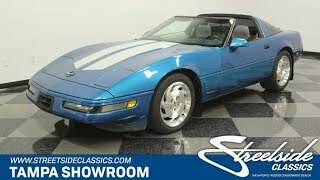 Rarity, enhanced power, and a distinct look all come together on this 1995 Chevrolet Corvette. So its amazing you can grab this much attention for the asking price. Thats why its one of the hottest deals around. The C4 Corvettes really had an instant presence. The long hood and short rear deck always looked good, but these later ones were allowed to mature into a far sleeker design. And speaking of sleek, the Bright Aqua Metallic retains a great shine to really highlight the crisp design of this car. Plus, its one of less than 910 examples that had this paint applied at the factory in 95. It was the rarest color of the year, and always had low numbers for the few years it was offered. So just the paint gives you instant distinction within the Corvette community. And more than just good body panels and the right color, you can tell this one has led a well-respected life by the details, like the flush headlights, smooth hatch action, and the way the large doors still shut with authority. While all this makes for a great classic, you also get hints at an upgraded personality. You see it in the how the front plate was replaced with an intake, ribbed taillight covers, and the dual silver stripes on the hood. The interior instantly reminds you this is a drivers machine. High-back bucket seats, a grippy steering wheel, and gauges that look like they were borrowed from a jet fighter it all gets your pulse racing. There are even some seat covers that go nicely with the black and silver attitude of the interior. But a Corvette is also built for the grand tour, and thats why its loaded with features. You get power windows, power seats, cruise control, dual airbags, and an AM/FM/CD stereo. Plus, that glass targa top is a great way to open up your car to the world whenever you want. And with automatic climate control featuring R134a air conditioning, feel free to enjoy open top motoring long into the summer. Chevrolets 5.7-liter LT1 V8 is a powerful and hardy fuel-injected motor. It only gets better with investments by the masters at Lingenfelter. They turned the performance up a notch by allowing this motor to inhale deeper, exhale with authority out of an upgraded exhaust, and tune the whole package for optimal driving. The four-speed automatic transmission is perfect for quick kick-downs to unleash the power, or just haply run the highway in overdrive comfort. And this one knows how to give you the optimal performance out of every road thanks to a fully independent suspension, four-wheel disc brakes, and grippy Michelin Pilot Sport tires on those shiny Corvette directional alloy wheels. This is rarity and distinction wrapped up in a powerful and great-driving package. So at this price, you know you need to hurry on this deal. Call today!! !